Three documentary films about the plight of homeless people living in Northwest Arkansas, produced by graduate students at the University of Arkansas, debuted this fall. Fayetteville, AR: This college town nestled in the Ozarks is the American Dream come true, but a growing number of men, women and children are calling the streets home. Vets panhandle in front of Walmart, and homeless folk are camping in the woods, sleeping at the bus depot, and escaping the elements at the local library. This is their story, and the stories of the compassionate volunteers who are reaching out to help. How can we fix this problem? We’re not sure … but we’ll start by not looking away. “We believe the story of one person can touch more lives than a thousand statistics could ever show, and we wanted to find a story that’s powerful…” These two filmmakers tell the story of homelessness in Northwest Arkansas by centering on one individual who seems poised to change his life for the better and for good. But can Clinton overcome the odds stacked against him? What will his next step be, and where will he ultimately end up? 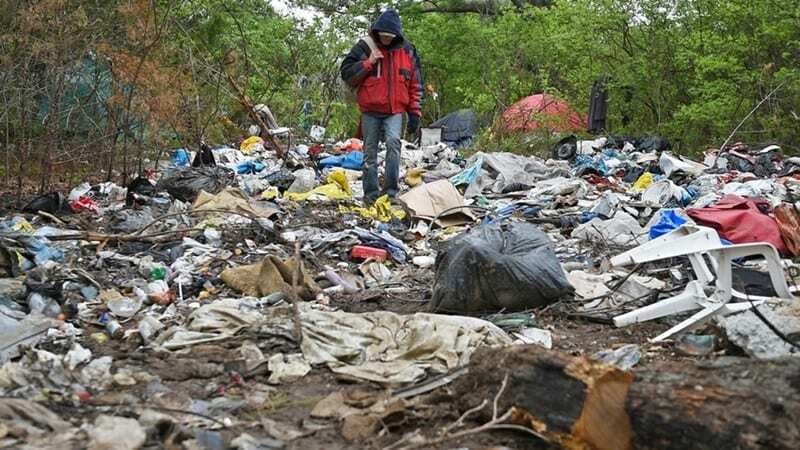 The film depicts the homeless crisis hidden in the woods of South Fayetteville, and the possibility of an innovative solution to provide transitional shelter for the Fayetteville residents in desperate need of shelter and other services. The film would not have been possible without considerable help from David King (pictured), professor Kevin Fitzpatrick, and the many people experiencing homelessness that generously offered their time and insight. All three tell compelling – and at times uncomfortable – stories of the growing homeless crisis in Northwest Arkansas. Foley said the students were all in the graduate documentary film classes taught by him and professor Dale Carpenter. Additionally, Kevin Fitzpatrick, University Professor and director of the Community and Family Institute, served as an advisor to all of the student filmmakers. Fitzpatrick has been studying the issue of homelessness for more than 30 years, and started Northwest Arkansas’ Point in Time Census in 2007. At last count, the census showed 2,951 homeless people in Washington and Benton Counties, with more than 50 percent of that population in the k-12 student age group. But, Fitzpatrick says, there is hope. Local service providers are making a difference for homeless people in the Northwest Arkansas area because they are addressing people’s needs in different ways. For example, Souls Harbor NWA, a transitional community for men in recovery that provides a pathway to self-sufficiency, has a success rate of 33 percent when the national average ranges from 9 to 11 percent. The three films featuring Fields and others were also screened at the David and Barbara Pryor Center for Oral and Visual History this fall, and recently aired on UATV, Cox 214 and uatvonline.net. Foley said he hopes that more films from future classes will shed light on additional important community issues, and that his current classes are already working on their next topic. For more information about the documentary film classes or students, visit the School of Journalism and Strategic Media online. For more information about homelessness initiatives at Fulbright College, please visit the Community and Family Institute online.